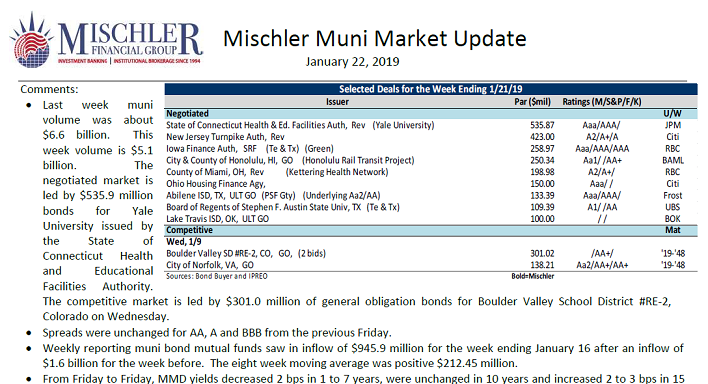 Mischler Muni Market Update; New Municipal Bond Offerings Scheduled for Week of January 22 2019- Mischler Muni Market Outlook provides public finance investment managers, institutional investors focused on municipal debt, and municipal bond market participants with a summary of the prior week’s municipal bond market activity, including credit spreads, money flows, and a look at pending municipal finance offerings tentatively scheduled for the most current week. Last week muni volume was about $6.6 billion. This week volume is expected to be $5.1billion. The negotiated market is led by $535.9 million bonds for Yale University issued by the State of Connecticut Health and Educational Facilities Authority. The competitive market is led by $301.0 million of general obligation bonds for Boulder Valley School District #RE-2, Colorado on Wednesday. During 2018, and full years 2017 and 2016, minority broker-dealer Mischler Financial Group Inc. underwriting roles (for which MFG has led, co-managed and/or served as selling group member) have included more than $1.3 trillion (notional value) in new debt and preferred shares issued by Fortune corporations, as well as debt issued by various municipalities and US Government agencies. 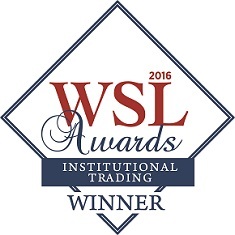 Mischler Financial Group is the securities industry’s oldest minority broker-dealers owned and operated by Service-Disabled Veterans. Mischler is also a federally-certified Service-Disabled Veteran-Owned Business Enterprise (SDVOBE). Mischler Muni Market updates and Municipal Debt New Issuance outlooks and summary of Municipal Bond Offerings Scheduled are provided as a courtesy to institutional clients of Mischler Financial Group, Inc. This document may be not reproduced in any manner without the permission of Mischler Financial Group. Although the statements of fact have been obtained from and are based upon sources Mischler Financial Group believes reliable, we do not guarantee their accuracy, and any such information may be incomplete. All opinions and estimates included in this report are subject to change without notice. This report is for informational purposes and is not intended as an offer or solicitation with respect to the purchase or sale of any security. Service-Disabled Veteran-owned broker-dealer Mischler Financial Group, its affiliates and their respective officers, directors, partners and employees, including persons involved in the preparation of this report, may from time to time maintain a long or short position in, or purchase or sell a position in, hold or act as market-makers or advisors or brokers in relation to the securities (or related securities, financial products, options, warrants, rights, or derivatives), of companies mentioned in this report or be represented on the board of such companies. Neither Mischler Financial Group nor any officer or employee of Mischler Financial Group or any affiliate thereof accepts any liability whatsoever for any direct, indirect or consequential damages or losses arising from any use of this report or its contents.